One of the major reasons why Agent Vinod was on the buzz circuit was because of director Sriram Raghavan. Having given us two wonderful thrillers before – Ek Hasina Thi and Johnny Gaddaar – we hoped that Sriram would complete his trilogy with this one. So does he manage to awe us once again with his style of story-telling? Saif Ali Khan aka Agent Vinod is a secret Indian RAW (research and analysis wing) agent who is on a mission to trace a deadly object, the identity of which even he doesn’t know. Along the chase he meets Iram (Kareena Kapoor), a Pakistani, accused of a bomb blast, who seems to have an agenda of her own but joins hands with Vinod for his mission. Let me be frank. 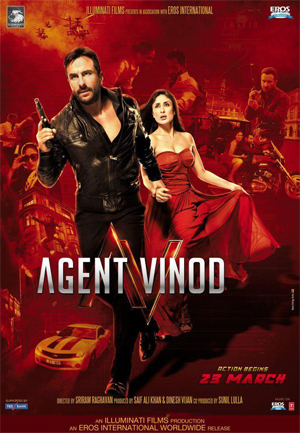 Agent Vinod is a mash up of sequences seen from umpteen Bond, Bourne and other series; you can figure out the inspirations behind many of the scenes you see. This is all good as long as you find the desi version interesting too. The movie starts off with a racy, entertaining escape sequence and you hope that the rest of the movie is fun too. Sadly, from then on, the movie shakes and wobbles and never quite manages to live up to its opening. The screenplay by Sriram and Arijit Bikwas has a major flaw, which often many stories suffer from: too many movies into one. The major flaw with Agent Vinod is that it has too many things pushed into it. After a point it becomes difficult to keep pace with what is actually happening and whether all of this is really relevant. The second flaw is that unlike his previous movies, there is basically no suspense here. The identities of the villains are revealed as is every sequence which occurs. What one has come to expect from Raghavan is that the movie might take a twist (a genuine one and not the Abbas-Mustan twists) at any time and things are definitely not what they seem. No thriller here, just plain cool-dude spy venture. And the third factor which goes against Agent Vinod is the length. Excruciatingly long, and after a point you just want the movie to end quickly. No surprises that the production values are at par; cinematography by CK Muraleedharan is great as are some of the action sequences. Although none manage to stay back with you after you come out of the hall. Pooja Ladha Surti’s editing is decent and she manages to do best with the story on hand. Songs seem forced and unnecessary although I must really mention ‘Rabta’. The way it has been picturized – as a romantic background score to an action sequence all shot in one take – is brilliant and this is one thing that will definitely be talked about a lot. Dialogues are witty; Saif gets some very smart punch lines and one-liners, but sadly these are not peppered much throughout the film. Johnny Gaddaar had this amazing concept of old Hindi songs as its background sequence. Raghavan tries the same here but it ends up sounding forced. Even some unique storytelling techniques he uses – like the Charlie Chaplin sequence – just don’t work and look very forced and fake. Where performances are concerned, Saif looks every bit smart, witty and dashing as a spy. However I doubt this character will be remembered much. The sketch is pretty weak and Vinod does not come out as much of a spy as one would have expected. For a spy he seems to be pretty easy trusting and gets caught and cheated more frequently than one would have expected. Yes, comparisons are bad but for a generation who has been fed on solid spy characters like James Bond and Jason Bourne, there are some expectations as to what a spy should be. Vinod is more of an action hero than a spy – we all know there’s a huge difference between the two. Vinod uses more of his muscles than his brains – barring one or two – in action scenes and doesn’t really seem different than a Dabangg or a Singham. Kareena looks sad and washed out and a tad disinterested too. Her character sketch is weak too. If Jenny in Ekk Deewana Tha made you mad with the question about whether she loves the hero or not, Iram here makes you crazy as to whether she is at the hero’s side or otherwise. There are too many side characters and villains crammed in here. Each does his part well but Ravi Kishen does stand out in his special appearance. Overall, the story has flaws, there is too much travelling to make you go dizzy and it’s not the Raghavan you wanted that you see. But it’s not all that bad either. The movie works in bits and parts and shines in a few sequences. A one-time watch. 17 queries in 0.417 seconds.